Custom clothes and accessories are a great choice for any corporate event – and high-quality business branded apparel can be the perfect balance of fun and thoughtful. Custom Under Armour apparel such as t-shirts, polo shirts, bags hats and caps all of which can be embroidered with your company’s logo to make the perfect personalized gift that both your employees and clients are sure to love. Gifts of high-quality clothing and accessories such as items from the Under Armour range are ideal because you can make them personal by customizing with your company logo, and also by choosing the right color, style, and fit for each of your employees, but without having to worry about trying to find a completely individual gift for each and every one of them. At what kind of cooperate events could you give custom Under Armour apparel as a gift? Looking for the perfect item to support your employees as they take part in a sporting event? Whether it’s a local fun run or a mega marathon you can promote your business and boost team spirit by giving participants some company branded Under Armour gear such as the Men’s or Women’s Qualifier Zip – with reflective zipper, and moisture transport system to keep sweat under control! During the festive season it’s nice to show your employees you care, but it can be challenging buying completely individual gifts for everyone in your business. So if you are looking for the perfect one-size-fits-all gift (not literally of course)! Under Armour apparel is ideal. A classic pair of branded socks such as the UA Charged Cotton® 2.0 No Show Socks works well for those on a tighter budget, or for those with more money to spend why not splash out on cozy and colourful fleeces such as the Men’s UA Storm SweaterFleece ¼ Zip – a lightweight fleece with brushed inner layer, and ribbed collar and cuffs? Giving a gift a President’s Clubs is a great way to woo your clients and add to the celebratory atmosphere. Giving a token at these prestigious events will be much appreciated and The Men’s UA Braided Belt could be a fun gift to kick off the evening in style. It’s nice to celebrate your business success and to share the wealth, so if your company has done well recently, then let your employees know how much you appreciate their hard work and boost staff morale by giving out UA branded clothing such as comfortable yet stylish tops, t-shirts or hoodies. It’s important to nurture the employees in your business and organizing regular team building events can help to encourage great working relationships. What better way to end the day then giving a goodie bag complete with a something from the Under Armour range? Their polo shirts, t-shirts, and hoodies can all be branded with your logo to remind everyone of a brilliant day. Giving customized, branded gifts such as custom Under Armour clothing and accessories is the ideal way to give a massive’ thank you’ to both employees and clients, as well as promote your business at the same time – it’s a win-win! Just because Under Armour clothing is sports-related doesn’t mean your business has to be, and your employees and clients don’t have to be high-performance athletes to enjoy Under Armour clothing and accessories either! Who doesn’t wear t-shirts, right? The charged cotton used to create the Under Armour Men’s Charged Cotton Sportstyle T-Shirt makes it beautifully soft, and the effortlessly stylish design means it is an ideal choice as a corporate gift. It’s super versatile and comes in a range of great colors so you can keep them all the same if you want your employees to have a more uniform look, (and can’t face any battles over who gets which color), or you can mix up colors and styles (such as short and long-sleeved options) to make gifts slightly more unique to the individual. For your female employees, the Graphic Crew comes boldly emblazoned with the UA logo on the front, leaving the back as the perfect space to add your company branding. It’s made from the same super soft charged cotton meaning it dries lightning fast too. These t-shirts are great gifts to give out at the end of team building days or just as a token of appreciation for hard work, and will be a gift your employees will be proud to wear all year round. Everyone loves a polo-shirt, and the Under Armour Corporate Men’s and Women’s Polo Shirts are stylish, soft and comfortable and their 100% Polyester Moisture Transport System wicks sweat and dries super fast. Polo shirts are a natural choice as they look great on all shapes and sizes and will make ideal gifts for your corporate event. They are perfect for corporate sports events such as 5k runs, or fun runs. These UA polo shirts have the logo placed subtly on chest leaving plenty of space for your own company logo to be embroidered on the front chest or sleeve. Under Armour has polo shirts for both men and women, both short and long-sleeved options, and all come in a range of great colors too so you can make sure your employees receive the right fit and style to suit them. Alternatively, if you’ve got a particular color associated with your brand why not choose the polo shirts to match? A cap is a fun, funky corporate gift that won’t break the bank. The Under Armour Custom Blitzing Cap is stylish, excellent quality and can be personalized with your company logo making it the quintessential branded gift for employees and clients. These cool, comfortable caps can be worn out on company trips, at sporting events, in the office or just day to day, making them not only a thoughtful gift but a fantastic and smart way to market your business while you are at it. Under Armour also offer cozy beanie hats in a range of great styles so if you want to give an excellent winter present this could be another good option. Want to make your team really stand out? The range of hoodies and fleeces from Under Armour are super soft and warm and look stylish and comfortable on both men and women. Check out the Men’s UA Rival Fleece Fitted Full Zip Hoodie with a breathable liner in the hood and front hand pockets for added comfort, or the wonderfully comfortable Women’s UA Rival Fleece Logo Hoodie with 4-way stretch construction and extended ribbed cuffs to trap in the heat. A fleece or hoodie is a perfect for those team away days, corporate events and occasions or just as a fantastic gift to thank employees for their work throughout the year. If you’d prefer to steer away from clothing, a bag or backpack is an excellent choice and would make a great holiday gift, or an ideal present if your employees travel a lot. The unisex UA Hustle LDWR Backpack is super versatile, durable and stylish too with a laptop sleeve, side water bottle pocket and water resistant finish it could be used for carrying work laptops and folders, heading out for a gym session or just for general everyday use. Customized with your company’s logo and that’s free advertising for you wherever your clients or employees go! Getting the balance right between corporate and personal, unique and relevant, as well as making sure that everyone in the businesses feels equally valued is no mean feat. Under Armour is a well-established, hugely respected brand so buying your clients and employees gear from them shows that you care and haven’t just rushed out and bulk-bought the first thing in your line of sight. Customizing with your business logo creates a sense of team spirit and is a great way to bring employees from all areas of your business together to celebrate your success. Of course, most business will have a strict budget in mind when it comes to planning corporate events, so finding gifts that fit in with the finances will be a priority. That’s another great thing about buying from the Under Armour range – they have a huge variety of products and accessories to choose from, so matter how extravagant or modest the budget, you can find stylish Under Armour apparel to present to clients and employees. Whatever the reason for your corporate gift giving, be it to celebrate a particular success or event, or because you just want to express gratitude to your team or customers at the end of a busy but prosperous year, giving branded gifts is a great way to kick off the celebrations with a bang! 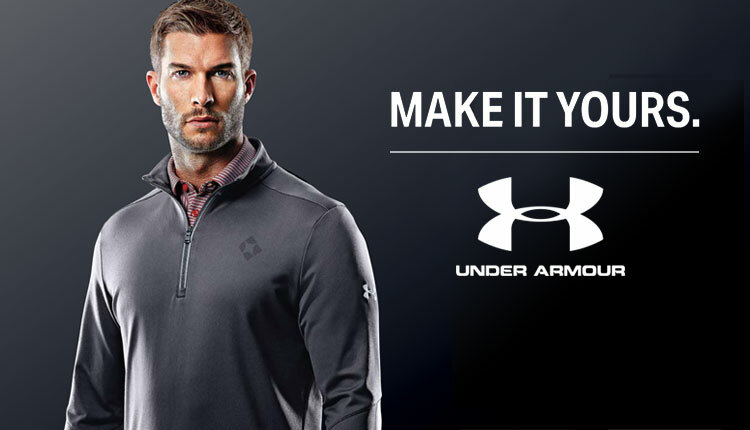 It doesn’t matter what industry you are in, branded clothing and accessories is a fun, thoughtful way to show that you care, so if you are hunting for an ideal corporate gift, the collection from Under Armour makes for a fantastic choice. No matter which Under Armour product you choose as your corporate gift, you really can’t go wrong. Whether you opt for a textbook tee, a classic cap or a pristine polo shirt, your employees will be left feeling appreciated, valued and motivated to continue contributing to even greater success for your business in 2019.